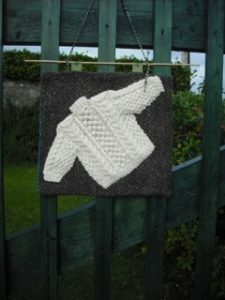 Una McDonagh is a native of the Aran Islands and one of our favourite knitting experts. Here she gives us a short history of the Aran sweater & its connection with Inisheer. I live on the island of Inisheer which is the smallest of the three Aran Islands that are located six miles from the mouth of Galway Bay on the West Coast of Ireland. Our community is small but tightknit and although sometimes a life that is cut off from the mainland can be challenging, the people of Inisheer have eked out a living for more than 4000 years. Self-sufficiency has always been key for survival and the locals here lived mostly by subsistence farming and fishing. People generally made their own clothes and hand knit sweaters and shawls were hugely important for warmth and durability. 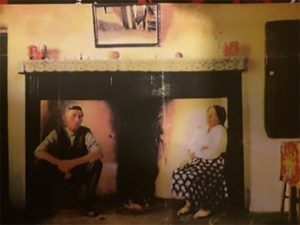 In the 1950’s the Irish government set up Gaeltara Eireann, a semi state body to help alleviate poverty and curb emigration from Gaeltacht areas (Irish speaking areas mainly along the western seaboard). Through this scheme they provided small grants to encourage people to set up cottage industries and craft projects as a viable business. Examples include lace making and the woollen industries. As a result of one of these projects a man by the name of Padraic O’Siochan decided to visit the Aran Islands with a view to market Aran Sweaters in America. He arrived by Steamer from Galway City one fine day and was rowed ashore by my grandfather Martin Sharry who took him to his home for refreshments where he related his project to my grandmother Kate Sharry who was a great knitter as were all her family. Padraic began the task of recruiting the ladies of Inisheer and the other Aran Islands to knit Aran Sweaters for export abroad. Thus was born a great opportunity for women young and not so young to earn some money for themselves. At that time there was no other source of income for women on the islands especially the smaller islands. Initially sizing was a problem as these women were used to knitting for husbands or brothers so the first samples had fabulously elaborately designed Aran stitches but unfortunately if you had a small stout husband you got a small stout sweater and if you had a tall skinny husband you got a long skinny sweater. A designer was brought in and taught the Agents all about sizing and they in turn explained to their knitters what was needed and they were off! After the initial teething problems of sizing the project got off to a flying start. The knitting wool was provided for the knitters and they were paid by the ounce for their labour when the garment was completed in perfect condition for inspection and then weighed and paid accordingly. Knitting perfect pieces to order continued right up until the 1980’s. The money earned made a huge difference to women’s lives giving them independence and allowing them extra comforts not afforded previously. To this day some of those women still knit Aran Sweaters to order.